when the summer is over and the fall is getting closer the great apple season starts in sweden. this season means alot of good apple pies to me and my family. one pie that most swedes loves to eat is smulpaj. it´s problably one of the easiest pies you can bake, it only takes around 30 minutes. this recipie is one that i found on the internet the other week and it´s made by the food creator sara ghisler (http://www.tasteline.com/Recept/Smulpaj_med_applen_och_notter_2). 1. preheat the oven to 200 degrees celsius/ 392 degrees fahrenheit. 2. peel the apple and remove the core, cut the apples in smal pieces. turn the appel pieces in the cinnamon-sugar mix. take a pie pan and spray it with melted butter and then place the apples in the pan. 4. place room tempreture butter, sugar, flour and nuts in a bowl and crush/crumble (mix it together) with your fingers (you can also use a kitchen aid mixer). 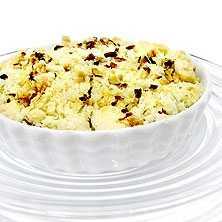 5. cover the apples with the crumbles and sprinkle some more chopped nuts on top. place the pie in the oven for about 20 minutes (it took a little longer time for my pie to be baked, around 35 min). the top should be golden brown and crisp. enjoy this great smulpaj/ apple pie with some vanilla icecream. I am already longing for fall.